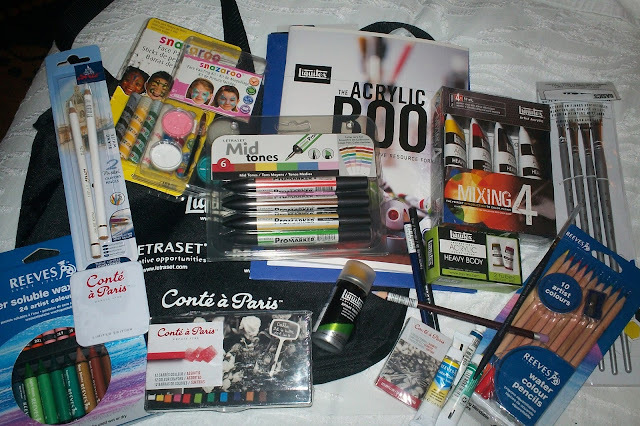 Art With Mr. E: NAEA FORT WORTH: SWAG! This is the contents of a special swag bag I received from ColArt for being in the top 20 blogs from The Art of Ed ! They were amazing!! They offered to help me with supplies for my main session...but since my session was advocacy....the offered to give me door prizes!!!!!!!!!! Gotta love that!! BETTER!!!!!!!!!! :) ha ha Emmy's just set there....I can actually use this! I am super jealous, but you so deserve it! Congrats! Art of Ed is awesome, I am so impressed with them. Btw, I wanted to meet you in person but was unable to :). You have really inspired me to pursue my own blog. Hope you had fun in FW! Leslie....I wish ya could have stopped by and said hello! I had 3 sessions, but only one had my name attached. Oh well..maybe next time. New Blog for Your Viewing Pleasure! COME SEE ME...ONE MORE SESSION TO GO! NAEA FORT WORTH: FIRST DAY FUN! Look Who's Going to Fort Worth With Me!